Wing (population approximately 75) is located in upper-eastern Illinois in the southwestern Livingston County area. Wing was established on the Norfolk & Western Railroad line and sits on County Road E 1300 N one-half mile east of Illinois Route 47. This places Wing about 15 miles southeast of Pontiac. The history of Wing is in need of research. The community appears to be an unincorporated hamlet whose biggest asset is its still-working grain elevator. What appears to be a former school building (pictured above) is located on the far southern edge of town, which had three class rooms with two classes in each room. We believe this served for sure as a 1-8 school and, possibly for a while, offering high school courses. The first school located in Wing was opened in Pleasant Ridge Township (where the village sits) in 1858, while another school was opened the same year. In March 1949, a favorable vote took place to a school consolidation effort between the towns of Forrest, Strawn, and Wing. This effort became a reality between the years of 1952 and 1956 with the creation of the Forrest-Strawn-Wing School District. The high school and grade school for the new district were located in Forrest. The Wing School served as a grade school for the Forrest-Strawn-Wing School District through 1966. 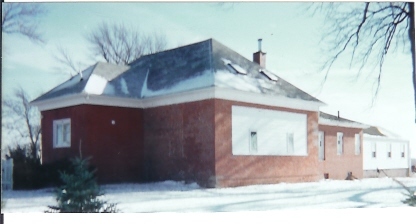 It only served as a K-3 building in its later years before being closed in 1974. Wing school annexed into Forrest-Strawn-Wing HS in the '50s, but it's last use was as a site for World Relief activities for the Apostolic Christian Churches of Forrest and Fairbury in the '80s and '90s. It served as a grade school for most of the '50s thru '70s. The photo above was taken in January of 2006. We are unclear if the Wing school offered high school curriculum let alone athletics. If you have this information, please write to us via e-mail so we can include the information on this page.